Why Do We Treat Animals Like Animals? 'Why do we treat animals like animals?' These were the lyrics of a song sung by Dr. Doolittle in the 1967 movie of the same name. Interesting question though. Why do we? Yes, I know they're animals, but so are we for that matter, and what Dr. Doolittle is really saying is, why do we treat non-human animals in such an inconsiderate and uncaring manner. Research has shown that they feel pain in exactly the same way as we do, and like us, they experience a range of emotions including fear, anxiety and grief. Surely the most uncharitable thing on our part must be the fact that we treat the most inoffensive animals in the very worst possible manner. Take sheep, for example. You'd be hard pressed to find a more gentle and peaceful animal. Do sheep ever hurt man? Never. Do men hurt sheep? You bet they do! It all starts when the lambs are 2-8 weeks of age. Their ears are hole-punched, their tails are sliced off, and the males are agonizingly castrated using either a knife, a crushing implement called an emasculator or very tight rubber rings. All extremely painful procedures. For cruelty, however, mulesing surely 'takes the cake'. This barbaric operation involves wedging the sheep's posterior into a contraption resembling a basketball ring then cutting off the skin around the tail area with a pair of shears. Five separate cuts are required and sometimes flesh and muscle is cut in the process causing lameness. Day to day life on the farm isn't exactly a holiday for sheep either. They may suffer from foot rot, sheath rot, fleece rot and mastitis. They starve in droughts and burn in bushfires. One million of them freeze to death each year after shearing. Sheep are also the main animals to suffer in Australia's live export trade which began back in 1945 when 24,000 sheep were sent from Western Australia to Singapore. 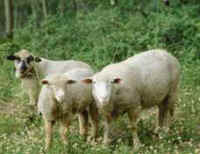 Australia currently exports more than 4 million live sheep per year to the Middle East. 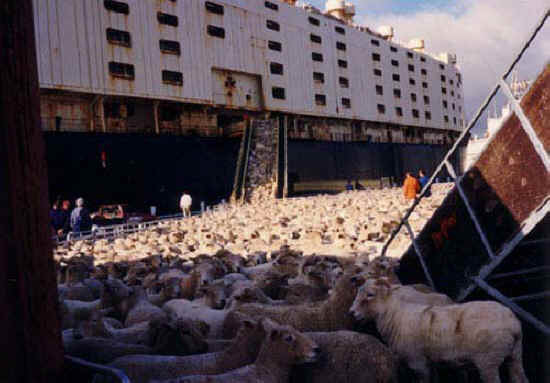 Even before embarking on the sea voyage many sheep are already suffering from exhaustion and stress as a result of traveling for up to two thousands kilometers and going for up to four and a half days without food and water. On board these floating factory ships they are packed three to a square meter and many of them die from starvation, disease, injury, heat stress and trauma. For those who survive the grueling voyage there is no cause for jubilation. Cruelty to animals is the norm in importing countries and sheep are routinely tied to roof racks or crushed into car boots in 40 degree heat. All will have their throats slit whilst fully conscious and die in terror and agony. 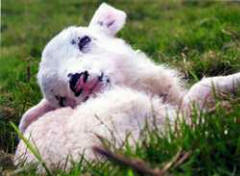 How can we justify treating our inoffensive, sensitive fellow beings with such a lack of consideration and compassion? Interestingly, many of these excuses are the same ones that people give today to justify their abuse of non-human animals. Visit our image gallery to see images of more brutality toward sheep and lambs.